Ready for the off: This group of cyclists will be cycling from Land's End to John o' Groats for charity. On Thursday June 14, a group of like-minded cyclists are undertaking the enormous challenge to cycle 1,600km from England's most southerly point Land's End to Scotland's most northerly point John o' Groats from start to finish, all within four days. The event is self-financed by all the cyclists and all of the proceeds collected will go directly to the three deserving charities listed. 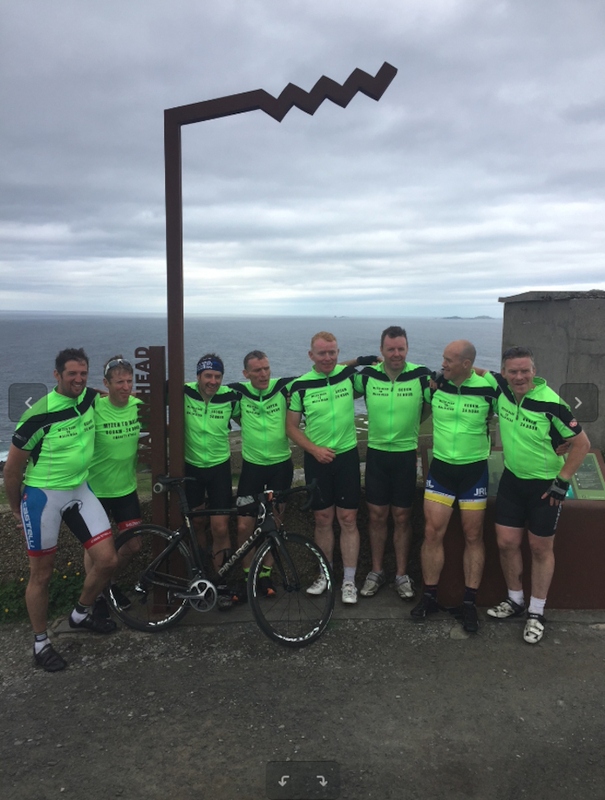 Cyclists completing the challenge are Gary Smyth and Gary Bigley (Kiltimagh ), Colm Carney (Bohola ), Pat Murtagh (Tubbercurry ), Jonathan Verry (Crossmolina ), Gerry Boots (Armagh and London ), and Alan Heaney (Killasser ). Speaking about the challenge Alan Heaney said: "Over the past two months, we have spent extensive hours cycling the roads of Mayo, Galway, and Sligo, getting long miles in, most of it in the wind and rain we experienced this spring of 2018. "Typical training sessions entail 200km early morning spins, starting at 4am from Swinford and returning back by midday. We do this at least twice per week to condition the bodies and build up miles in the legs. While we are in pretty good shape physically, this 1,600km cycling challenge will take its toll, not just on the body but on the mind. It is really a psychological challenge and we hope we can handle the mental challenges this journey presents us. "At this moment, we would like to take the opportunity to thank all who have donated to date, our wives and families for their support, our fellow cyclists, and last but not least our support team, four of them in total – Martin Conlon [Bohola], Martin Conlon [London], Ryan Prendergast [Swinford], and Brendan Doyle [Swinford] who will be at our beck and call for the whole 1,600km journey. We heavily depend on our support team, as completion of this tough task depends on everything running with military precision."